Hey!! We'll give you the insights to get on the 'net' and find what you're looking for. We'll help you solve connection problems, update you on the most current trends and keep you posted on the status of the Internet. is taking the Internet into homes across Nevada. Don't Miss it! When you're talking about the Internet you're talking a language that Brian Borysewich knows. Whether it is history, technology, how to or why, when the conversation is about issues On-Line the "Net Head" is right at home. The show focuses on topics that provide insight into the uses of the Internet, the tools used in accessing the Internet and conversations about the Internet. 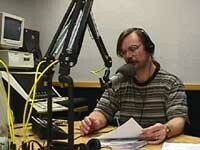 In hosting the radio show, Brian has been able to take his knowledge to the public and become their resource for information and help with the Intemet. The "Net Head" either knows the answer or will get it for you. The show's low key approach and interactivity with on-line and on-air participation by the listening audience provides a new facet to talk-radio. The target audience is the computer user who is now beginning to explore the Internet or has experience with the Internet and is listening for entertainment or additional information on new technologies and products. Brian's "AVERAGE KIND OF GUY" approach and his clear focus on this hot topic makes the show a definate winner. E-mail questions and comments are taken during the show at surfsup@radiodude.com during the Broadcast. Ask technical questions, even call in and help others, compete for prizes and learn about cool and fun web sites each and every show. Each show and it's broadcast and web sites featured are archived for your future enjoyment. Tell your friends about Nevada's first and only Internet Show and we'll see you each and every Friday!